The massive influx of people to Central Europe in recent days boiled over into a diplomatic spat on Saturday, while violence broke out on the Slovenian border as migrants sought a new way into the region. Croatia on Friday began bussing migrants to the Hungarian border without an agreement with the government, prompting Budapest to accuse Zagreb of failing to observe its international obligations on the treatment of migrants, which oblige European countries to process asylum requests. But Croatia said the strain was too big and it would continue to send migrants to the border. “We forced them to accept them by sending them there,” said Croatian Prime Minister Zoran Milanovic, adding that he hadn’t spoken about the crisis to his Hungarian counterpart, Viktor Orban. About 21,000 migrants have entered Croatia since Wednesday, the government said Saturday. Relations between the two countries were strained further after 1,000 migrants were escorted via train by 40 armed Croatian police officers. “Croatia has violated Hungary’s sovereignty” by sending migrants accompanied with armed police to Hungary’s territory, a behaviour not fit for a European country, Hungarian Foreign Minister Peter Szijjarto said Saturday. If Croatia doesn’t want to defend its borders from the migrants, Hungary will block Croatia’s membership of the European Union’s mostly document-free Schengen zone, Antal Rogan, the Hungarian premier’s incoming chief of staff, said in an interview with Inforadio. Victor Orbán is resurrected Hungary’s dark past to keep refugees out and transform the Magyar nation into an illiberal democracy. When God created the world he invented history a few seconds before he did economics. Being a poet—and, it is said, the Muses are the Daughters of Memory—he liked to let them float beside each other and observe the shapes they made. One of the more memorable but highly shifting shapes was Hungary. The shape of Hungary, a linguistically isolated island in the middle of Romance-, Teutonic-, and Slavic-speaking peoples, has changed considerably since it first came into being, traditionally in 896 AD when the Hungarians swept into and occupied the Carpathian Basin. The country has seen its fortunes ebb and flow a great deal since then, sometimes to major power status, though it did a great deal more ebbing than flowing after 1526 when Hungarian forces were defeated by Suleiman the Magnificent, whose Ottoman forces remained in control for over 150 years. Immediately on their heels came the Habsburgs, who became the crushing dominant power despite the revolution of 1848, until 1867, when the dual monarchy of Austria-Hungary was established. There followed a period of some 50 years, which many Hungarians now regard with considerable nostalgia. The great trauma of the Treaty of Trianon of 1920 following the defeat and collapse of the Austro-Hungarian Empire burned deep and still does. In the inter-war years, however, a certain independence was maintained under the Regency of Admiral Horthy. That, too, ended badly with defeat at the end of the Second World War, which was followed by Russian occupation until 1990, since when no one has occupied Hungary. Now the alarm bells are ringing—they ring with the slightest breeze in Hungary—that the Muslim hordes, so reminiscent of the Ottoman Empire, are returning to reclaim control. In actual fact the hordes—or Syrian and other refugees, as most people refer to them (many of the professional class)—have no intention of staying in Hungary. 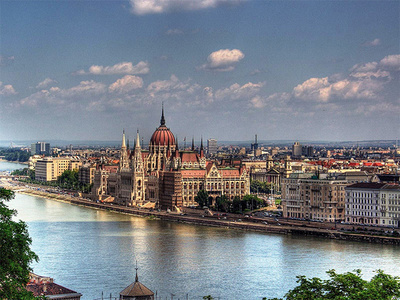 Hungary is a passage through into the rest of Europe. Bells ring because the government keeps ringing them. It knows that when the tocsin sounds everyone huddles into church and the church of government is right there to accommodate them, complete with hellfire preachers and folk dancing. Hungary is, as Prime Minister Victor Orbán frequently reminds his people, a Christian country, and intends staying that way, Christian, white, and of genuine Hungarian stock. Orbán regards his 800,000 Hungarian Roma as not quite Hungarian, more as a kind of disadvantage that he has so far neglected to loose upon the rest of Europe. In that respect they are like those refugees at the gates. This neglects the fact that the Roma have lived in Hungary for 600 years and consider themselves Hungarian. Elements of Orbán’s party, Fidesz, like their further-right political rivals in Jobbik, are not too sure about the Jews either and protest that despite the deportation of some 565,000 Jews in quick order in 1944, with ready and eager Hungarian help, Hungarians had absolutely nothing to do with the murder of three-quarters of the Jewish population and that Hungarians were as much victims of the Germans as the Jews. That is the way it works. This posture entails harking back to the 1890s and regarding the ’30s through ever rosier glasses. It means rehabilitating Horthy in the first place, and returning to the literary canon authors who supported not only Horthy but Hitler, too. mystagogues, willowboys, straight from the dung heap. finger bones beckon a nation beyond cure. But that is not the only problem. Expectations were too high, and fulfilment far too low, in 1989. Old political parties fell apart, new ones formed that governed a while, then also fell apart. Only the non-executive and neutral presidency, in the form of the almost saintly Árpád Göncz, held it together for 10 years. But even so there were tensions. Making a radio broadcast in 1995 my producer, Tim Dee, and I were surrounded by a bunch of middle-class, middle-aged right-wingers who accused Göncz of being a secret agent. We escaped without hurt but it was a close thing. But whose were the expectations, and of what? If history comes, can economics be far behind, to misquote Shelley? The first expectation was that soon, ideally immediately, everyone would be better off. There would still be full employment insofar as it counted as full employment, and people wouldn’t be stuck with those awful rattling East German spin-driers. It wasn’t so much 97 more brands of toothpaste people wanted as the assurance of knowing that they could enjoy life at something close to a Western standard of comfort. Economics meant the reorientation of the Hungarian economy and privatization, and that entailed corruption and quick private profit. It also meant corruption at the more general political level. There were countless skeletons in cupboards to be discovered, and old Communist forms of corruption soon gave way to later, more efficient models. Soon there was unemployment and inflation. The left and centre left kept bobbing about in a faintly Blairite fashion. Social liberalism split from economic liberalism in practice while being identified with it not only in public perception but in terms of political rhetoric too. Disillusion came very fast, almost before illusion had completely faded. One of the most interesting figures to rise in 1989 was the current prime minister, Orbán. I was in the main public square on the occasion, in June that year, of the reburial of the 1956 Prime Minister, Imre Nagy. Orbán was the least known of those who spoke from the podium but made the most memorable speech, chiefly because of its boldness and aggression, demanding that Soviet troops leave Hungary as early as possible. Nothing had been settled and such talk was still considered dangerous. A handsome young man with a flop of dark hair, he was photogenic too. In terms of politics he had joined Fidesz, the then-liberal party formed exclusively of those under 30 (almost more a party than a Party). But both party and Party soon broke up over differences in vision and approach and Fidesz was left in the lap of Orbán, who decided to lead it in a distinctly nationalist direction. The first freely elected government after 1989 was the conservative Democratic Forum (MDF), which was pretty well wiped off the map by the time the next elections came along in 1994. They were succeeded by the MSZP (the liberal socialists of the old regime together with other democratic socialist groupings). After they failed too, Orbán’s Fidesz got its first chance at governing in coalition with what was still left of the MDF and a Smallholders Party left over from the war—in other words, a right-of-centre alliance. They too were kicked out in the next elections and succeeded by a coalition of the socialists MSZP and the Free Democrats (SzDSz), who represented the liberal intelligentsia that had been half the underground resistance to the old regime. After various troubles and scandals—not least the leaked closed-doors in-party address of the then-prime minister Ferenc Gyurcsány—Orbán swept to power with a super majority in 2010. One night, after the failed uprising of 1956, when I was just eight, my family walked illegally across the Hungarian border into Austria. It was 1956. It was dangerous to do so but at least we didn’t have to face the possibility of a sinking boat or suffocation in a truck. Why did we do it? No one discussed it with me then, just as no one has told the young children crowding at the Hungarian-Serbian border. Europe was well prepared for us. There were Austrian camps ready, and within three days we were offered a flight to England, a country we had never visited or dreamed of visiting, but which was also well prepared for us. A couple of weeks ago I was back in Budapest meeting a friend at the Keleti railway terminus. It was very hot. We emerged from the escalators leading up from the metro and saw the refugees: families, individuals, children aged eight and under. A crowd of 70 or so at the front of the station was chanting: “Germany! Germany!” faced by a line of cops equipped for riot. There were more cops inside and outside the station, impassive, a little bedazzled, perhaps a little bored, preventing refugees from entering and boarding the train for which they had tickets but no papers. A man slunk by, muttering: “Welcome to Hungary.” The waiter at the buffet added that it was like 1,000 years ago: once again Hungarians were the border guards of Christian Europe. That’s not strictly accurate, of course. About 1,000 years ago it was the non-Christian Hungarians who were the migrants, taking over, entering and settling the Carpathian basin and the Hungarian plains. The borders of Christendom came later. But we are back with Christendom. It is Christian Europe Hungary is defending from Muslim hordes and terrorists, says the prime minister, Viktor Orbán. He wants to save Hungary for “genuine” Hungarians: not all Hungarians are genuine Hungarians, after all. Needing the genuine Hungarians’ support, he sent out a questionnaire implying that migrants were spongers or terrorists, and put up billboards, addressed to the refugees, in Hungarian – a language none of them can read – telling them that they would not be allowed to take Hungarian jobs. Hardly any actually want to stay of course, but you have to reassure the natives – especially after frightening them in the first place. Hungary has a history with the Ottoman Empire, and Orbán is busy conjuring it. The Ottoman Empire is striking back, he warns. They’re taking over! Hungary will never be the same again! He must act the strong man because the would-be even stronger men of the far-right Jobbik party could supplant him at the next election. Hence the wire; hence the army; hence, as from today, the state of emergency; hence the fierce, unrelenting rhetoric of hatred. Because that is what it has been from the very start: sheer, crass hostility and slander. There is certainly a logistical and moral problem for Europe, which has signally failed to deal with a tide of refugees not seen since, well, the Hungarian ones in 1956. But it’s bigger now, harder to regulate and place. Germany and Austria have already accommodated a good number but cannot keep taking. David Cameron says the UK has given generously to millions of refugees trapped just beyond the Syrian border. But the refugees who have paid to take the dangerous route, who have survived and are now at the Hungarian border and were at the station, are from today, contrary to the Geneva convention, criminals to be jailed for up to three years for evading or damaging the fence. It is of course shameful that the UK, whose actions in Afghanistan and Iraq helped in the long term to precipitate the crisis, has done so little for them. But it is even more shameful how the Hungarian authorities have not only mistreated but demonised them as a matter of policy. That is different from an organisational or even moral failure. It is what Orbán and his government will regard as an organisational and moral success. Fear, hatred and racism is their business. A Roma leader yesterday said the government had referred to his people as a problem Hungarians have been generous enough not to foist on Europe. Roma too are Hungarians, and have been for 600 years. But the whole world is witness. The reporters and film crews are there. Hungarians, as a people, are no worse than anyone else – thousands of volunteers have been helping the refugees for weeks – but they don’t act for the government. Despite their good work, thanks to the actions of the government, the name of Hungary stinks to high heaven.